August Update: Twist Collective, Knit Picks, and more! A lot of news for you! I’ve had a couple third party releases; they’ll each get their own blog post, but I wanted to introduce them here. 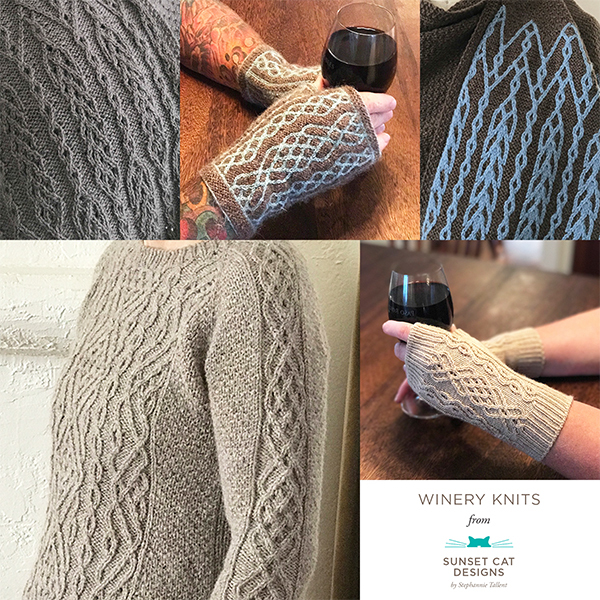 Chalcedony Mittens, in the Knit Picks Twist and Tweed Collection, worked in City Tweed. Fretwork, in the Fall 2015 Twist Collective, worked in Pigeonroof Studios American Sock. Also, I’m testing the next set of Spa Cloths in the Sunset Cat Rav group here. I expect to publish these before the end of August. Newsletter subscribers, be on the lookout for a special coupon 🙂 . I’m also testing a lovely cabled stole in the group as well; here’s a pic to tempt you. It’s worked in Anzula For Better or Worsted and is beyond sumptuous. Wondering where the podcast is? I’m planning the next episode closer to the end of August. I’ll be reviewing a bunch of books & knitting accessories. Next post: Short Rows Knits and Guest Post by Carol Feller! Previous post: A Plethora of Patterns!